Why use electrons instead of light in a microscope? Given sufficient light, the human eye can distinguish two points 0.2 mm apart, without the aid of any additional lenses. This distance is called the resolving power or resolution of the eye. A lens or an assembly of lenses (a microscope) can be used to magnify this distance and enable the eye to see points even closer together than 0.2 mm. A modern light microscope has a maximum magnification of about 1000x. The resolving power of the microscope was not only limited by the number and quality of the lenses but also by the wavelength of the light used for illumination. White light has wavelengths from 400 to 700 nanometers (nm). The average wavelength is 550 nm which results in a theoretical limit of resolution (not visibility) of the light microscope in white light of about 200 – 250 nm. The figure below shows two points at the limits of detection and the two individual spots can still be distinguished. 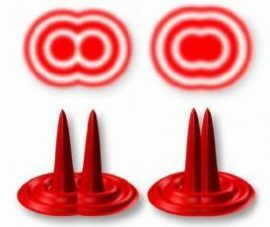 The right image shows the two points so close together that the central spots overlap. The electron microscope was developed when the wavelength became the limiting factor in light microscopes. 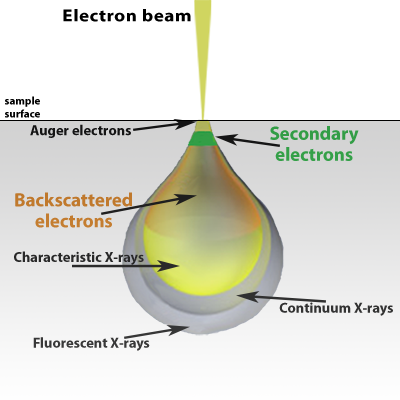 Electrons have much shorter wavelengths, enabling better resolution. As dimensions are shrinking for materials and devices, many structures can no longer be characterized by light microscopy. 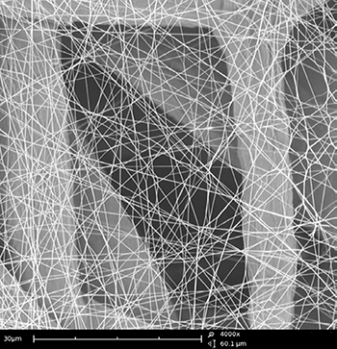 For example, to determine the integrity of a nanofiber layer for filtration, as shown here, electron microscopy is required to characterize the sample. 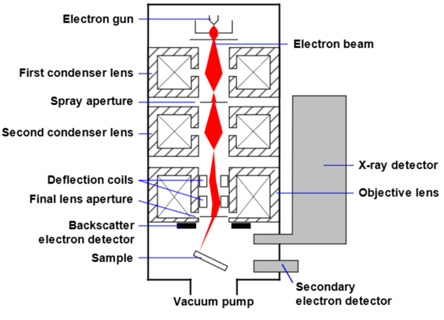 Electrons are produced at the top of the column, accelerated down and passed through a combination of lenses and apertures to produce a focused beam of electrons which hits the surface of the sample. The sample is mounted on a stage in the chamber area and, unless the microscope is designed to operate at low vacuums, both the column and the chamber are evacuated by a combination of pumps. The level of the vacuum will depend on the design of the microscope. The position of the electron beam on the sample is controlled by scan coils situated above the objective lens. These coils allow the beam to be scanned over the surface of the sample. 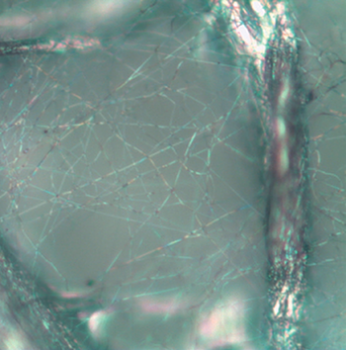 This beam rastering or scanning, as the name of the microscope suggests, enables information about a defined area on the sample to be collected. As a result of the electron-sample interaction, a number of signals are produced. These signals are then detected by appropriate detectors. 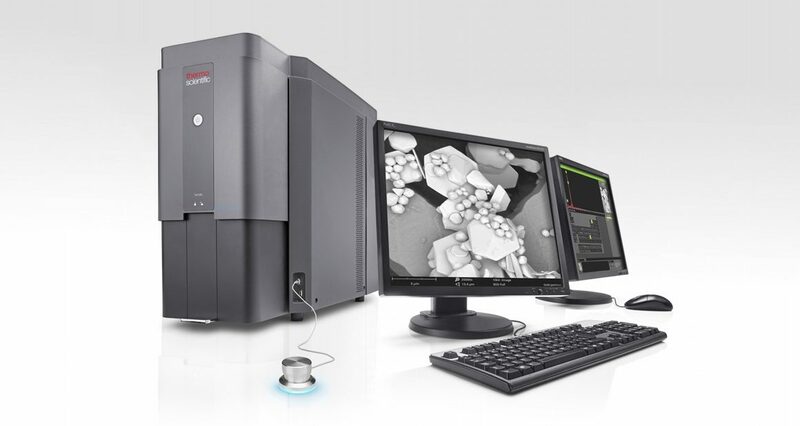 The scanning electron microscope (SEM) produces images by scanning the sample with a high-energy beam of electrons. As the electrons interact with the sample, they produce secondary electrons, backscattered electrons, and characteristic X-rays. These signals are collected by one or more detectors to form images which are then displayed on the computer screen. When the electron beam hits the surface of the sample, it penetrates the sample to a depth of a few microns, depending on the accelerating voltage and the density of the sample. Many signals, like secondary electrons and X-rays, are produced as a result of this interaction inside the sample. Schematic of electron beam interaction. The maximum resolution obtained in an SEM depends on multiple factors, like the electron spot size and interaction volume of the electron beam with the sample. While it cannot provide atomic resolution, some SEMs can achieve resolution below 1 nm. Typically, modern full-sized SEMs provide resolution between 1-20 nm whereas desktop systems can provide a resolution of 20 nm or more.